JANUARY 15, 2019 • Stay Connected! Broker is correct in diagnosing the effect of "will" versus "will not" in Form 22A, paragraph 3(c). 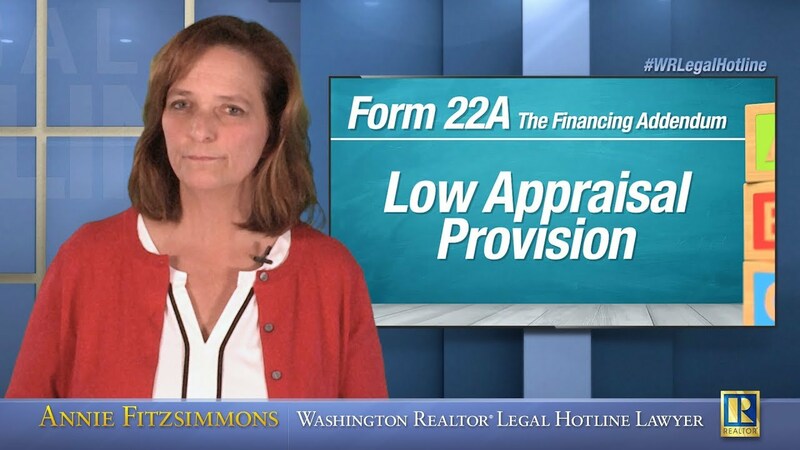 If the default provision of "will" is selected, the effect is that when buyer waives buyer's financing contingency, buyer will also waive the benefit of the low appraisal provision (paragraph 7 of Form 22A). Marking "will not" preserves the benefit of the low appraisal provision, even if buyer waives the financing contingency in response to seller's delivery of a "Notice of Right to Terminate". Transactionally, selecting "will" favors the seller and selecting "will not" favors the buyer. How the box is marked in any given transaction should be the subject of negotiation and every broker should walk their client through the Form 22A, and all of its provisions, in every transaction, so that broker's client understands the effects of all the provisions of the form. Only then can a party negotiate the terms of the agreement from a position of knowledge that allows the party to negotiate the terms intended by the party rather than those prescribed by a generic legal team that drafts the statewide forms but that does not represent the party. Broker should reconsider her analysis of default prompts in the statewide forms. Default provisions are included with most blank spaces in the statewide forms system in an effort to prevent brokers from achieving "mutual acceptance" only to discover that a defect in completion allows one of the parties to terminate. A failure to achieve a meeting of the minds on important terms could result in a transaction that is voidable because of an ambiguity or failure to agree. For example, if it is agreed that buyer will have the benefit of an inspection contingency but the parties fail to agree as to the duration of the inspection contingency, what is the significance of that and would that ambiguity allow either party to terminate the agreement? To avoid that question, the drafters of the statewide forms supplement most negotiable terms with a default term, such as including "ten days" as the duration of buyer's inspection contingency. However, every default term should be considered a back up, preventing a defective contract, and not a standard. For example, it may be that buyer wants to be very competitive in a multiple offer situation and will reduce buyer's inspection contingency to only five days. Or, it may be that buyer is purchasing a hunting cabin in a remote location and buyer increases buyer's inspection contingency to 30 days to ensure opportunity for access. The duration of the inspection contingency should be discussed between buyer and buyer's broker when buyer's offer is written and should be discussed between seller and listing broker when buyer's offer is considered and in every case, the provision should be drafted by broker in accordance with the client's instructions. The default term should be retained only if broker's client believes that ten days is the proper length of time for the buyer's inspection contingency. With respect to the question asked, Form 22A, paragraph 3 is the Seller's Notice of Right to Terminate provision in buyer's financing contingency. The whole point of Form 22A, paragraph 3, is that the buyer who asks seller to take a risk by selling to the buyer, who is dependent upon obtaining a loan to complete the purchase, offers seller a way to terminate the PSA if buyer does not show satisfactory progress toward obtaining buyer's loan. Paragraph 3(c) further defines the protection offered to seller by allowing the parties to negotiate whether buyer's waiver of the financing contingency, at the request of seller, will also cause a waiver of the low appraisal provision. If the box is marked "will" then buyer should know that buyer cannot delay in ordering buyer's appraisal. It will be important for buyer to evaluate the appraised value of the property at the time that buyer is asked to waive the financing contingency. If the box is marked "will not" then buyer knows that buyer has a bit more latitude in scheduling the appraisal because waiver of the financing contingency will not impact the low appraisal provision. Simply put, broker should draw no significance as to the desirability of contract terms based on the prompting of a default term included by the lawyers who draft the statewide forms. Default terms are supplied only to help prevent brokers from erring in completion of the forms by failing to include a critical term. Broker should discuss all of the terms of the PSA with broker's client prior to a buyer signing an offer or a seller accepting or countering an offer. Default terms should be rejected every time a party prefers some term other than the default term and the client's actual desire for the provision should be drafted by the broker. REALTOR® members who have leadership experience at the local and/or state level, but have not yet been actively involved at the national level, should apply to the Leadership Academy. The Academy is focused on developing participants' institutional, industry, and association knowledge. (Source: YPN Lounge - Samantha Jones) Before we’re back to the grind of the spring market. Right now is the best time to create habits and strategies you can refer to all year long. (Source: Inman) Everybody knows to pay attention to how a home looks when you’re showing it or hosting an open house — but not everyone pays attention to how other senses like smell and touch can affect a potential buyer’s perception of the space. For Hoby Wedler, who earned a PhD in Chemistry from the University of California at Davis and has been blind since birth, the connection is obvious; it’s one reason he founded Senspoint Design, which helps companies design spaces that cater to every sense. Washington REALTORS® from all over are getting geared up and excited about this annual event. We have some exciting things happening at "Hill Day" this year. Learn more about our Legislative Priorities and the Unlock the Door for Affordable Homeownership initiative. Don't forget to download the Event App to access meeting materials, event info and more.